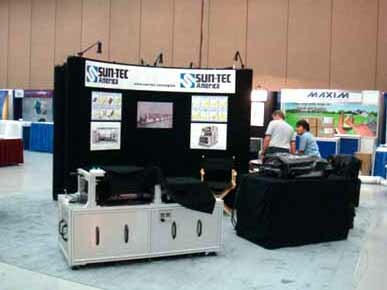 SUN-TEC BLOG! : SID 2010 opening ! We are back in SID show again ! SID 2010 will opened from tomorrow in Seattle this year. Seattle is very famous for Ichiro Suzuki of Mariners. Today,we set up our booth and install machines. SID 2009 in San Antonio was kind a quiet due to the swine flu. In this year, we are expecting more visitors because display industry is very active now for 3D or Flexible paper display. When I looking around in the exhibition hall, I see all booth intend the trend. Sheet to Sheet, Roll to Sheet, Roll to Roll and Rigid to Rigid.